A friend of mine just build a new home and had a room off the garage that needed to be filled. She came to me with a few ideas and this is the mudroom I created for her and her husband. Super neat seating, storage, and shelving!! Awesome work! We are creating a mud room of our entrance, this is exactly what we want in there! If only we had the room for this - SO nice!! Beautiful!!! Kylie really knows how to utilize space ! Perfectly finished ! 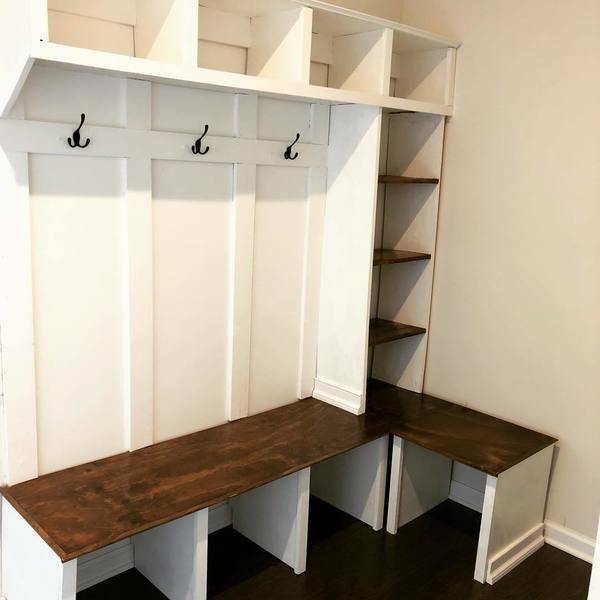 This is awesome, I wish I had a mudroom for you to makeover! Would be PERFECT to organize all my kids stuff! What a beautiful use of this space! Need this for my house!